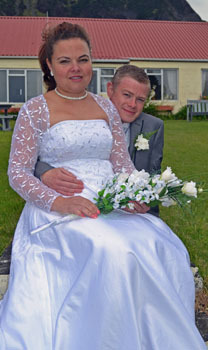 Sonia Swain married Andy Williams in St Mary's Church on 9th October 2014. Sonia Swain married Andy Williams in St Mary's Church on Thursday 9th October. Given away by her father Thomas Swain, the wedding was conducted by Rev Denzall Snell and was followed by photographs taken in front of The Residency on a beautiful spring afternoon and afterwards by a Reception in the Prince Philip Hall. 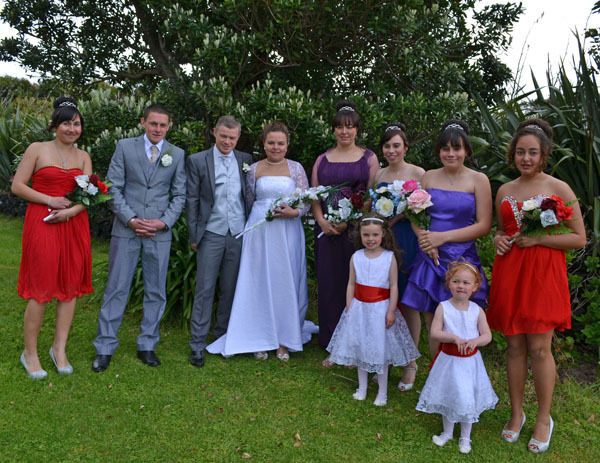 Photo shows the bridal party with Best Man George Swain alongside Andy and Sonia with Maid of Honour Natasha Glass to Sonia's right and the bridesmaids left to right: Lynette Green, , Glenda Swain, Rhyanna Swain, Chloe Glass and in front Andy and Sonia's daughters Natasha and Mia Williams. Above: Family group at the Reception in the Prince Philip Hall. 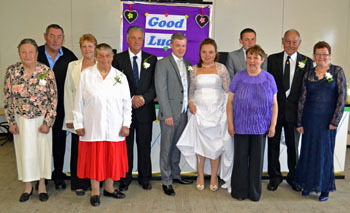 Left to Right: Amy Green, Richard and Francesca Green, Lucy Swain, Thomas Swain, Andy and Sonia Williams, George Swain, Carol Swain, Harold Green and Pamela Swain.